If 1999 is to be remembered for anything remotely edifying, it will surely be for the incredible regeneration of Shakespeare fever which seems to have gripped the nation and indeed the world. In January he was named Briton of the Millennium by Radio 4's Today programme. In March the whimsical film based on his alleged London love life Shakespeare in Love won seven Oscars (including one for the RSC's Stephen Warbeck) and made a household name of Gwyneth Paltrow as his 'dark lady'. It seems appropriate then that the place where it all began back in 1564 has just embarked on its most far-reaching restoration for 50 years. Befitting its highly significant but charmingly discreet place in English heritage's role of honour, the first stage in the 're-dressing' of Shakespeare's birthplace was revealed, without so much as a whispered aside, to the public this week. The first room to be 're-displayed' is the original cradle of the Bardic canon itself - his birthroom. This low-ceilinged, half-timbered chamber, from whence the young William leapt into the world, has been decorated as it might have looked in 1575 when Shakespeare was just eleven. 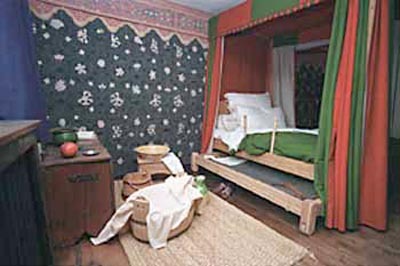 The walls are adorned with specially customised wall cloths, the bed - complete with stow-away truckles (16th-century futons on wheels) - has been adorned with traditional woollen say drapes, and children's garments and toys of the age are strewn around the room to give it that authentic 'lived in' look. The room is a mix of original items from the middle to late 16th-century furniture and carefully recreated replicas, all lit by carefully crafted electrified 'candles'. In 1575 there would have been seven Shakespeares (two parents and five children), some servants and maybe an apprentice living in the house, so it would have been pretty cramped and busy. Roger Pringle, director of the Shakespeare Birthplace Trust, said the 'refit' for the birthroom was two years in the planning but only took a matter of days to put in place! "However, researchers and academics have been gathering information and reinformation ever since the birthplace's last major redesign back in 1949-50." We have taken into account evidence gleaned over the past half-a-century. Of course, we now know more about the life of Elizabethan England than ever before and this is the coming together of years of research", enthused Mr Pringle, who is also the new chairman of the Stratford Society. The refit of the birthroom is the start of an ambitious plan to re-dress the birthplace, bringing the house more closely inline with how the Trust thinks the rooms would have been decorated and furnished when William Shakespeare was a young boy in Elizabethan Stratford. Interestingly, instead of the familiar dark brown, polished look one associates with 16th-century furniture, the replica bed is its original light colour. "All 'new' furniture would have looked like that in those days of course", explained Mr Pringle who added that the house's guides will have a lot more material from which to embroider their talks to tourists. The project, which will include a reconstruction of Shakespeare senior's glove-making workshop on the ground floor, will cost in the region of £250,000. The Birthplace Trust is meeting most of the expense, but the London-based Clothworkers Foundation has agreed to foot the cost of the bed drapes and the Worshipful Company of Glovers from West Sussex has pledged it will supply unworked leather to use in the glove making display. The parlour will also undergo a 'make-over' to bring it to 16th-century life. Mr Pringle would dearly love to see the entire house completed for the birthday celebration next year but with work on the property restricted to the off-peak tourist season, he's not promising anything. "There's a great deal of planning to be done and we have to make sure our research is transformed into a genuine replication of things as they were in order to bring the house back to life", said Mr Pringle. Ann Donnelly, the Birthplace Trust's museum curator, could not hide her excitement. "We have embarked on ground-breaking work to improve the interior look of a 16th-century structure - one of the first projects of its kind in the world. "We're determined to get it right and the recreation of the decorations and artefacts have been painstakingly analysed", she said. To re-dress the birthplace in the manner of the period, researchers have used 16th-century documents for their décor information. Mr Pringle explained: "When people died in those days inventories were drawn up listing all moveable items (fixtures and fittings to us) left in their possession. We have drawn a great deal of information from these lists", he added. For instance, although William's father was relatively comfortable, he was only middle class and not overtly wealthy. So, bearing this in mind, the wall coverings are as authentic as possible. "The very rich lined their walls with tapestries, but someone of John Shakespeare's means, for example, would have bought sheets of linen and have had them decorated by local wall artists. This we have tried to recreate", added Mr Pringle. There are to be some structural changes, too. "We're going to 'rebuild' the loft using a cut-away technique enabling people to picture the real height of the ceilings and show what Mr Shakespeare kept in his attic!" The birthplace is also going to be made more accessible for the disabled with the construction of ramps up to the house, a bigger entrance into the property and it is to become more user-friendly for the partially sighted. "Obviously we are restricted by what we can do to help wheelchair access because of the age of the property", concluded Mr Pringle. The display cases are to be enhanced too, presenting a comprehensive history of the house as a tourist shrine. The lighting and heating systems are also to be revamped making this a major move forward for one of the most historic birthplaces in the world.